If you’ve ever taken care of a sick child, you may be familiar with the feeling I had this week, something along the lines of, “Oh sweet smiling Jesus, will this ever end? !” Foster Baby had a high fever and an ear infection, and let’s just say his rule is if Baby ain’t happy, ain’t nobody happy. Granted, this was only his second real illness in almost eleven months of living in our house. Once I get a little distance from this experience, I’m sure I’ll feel grateful that we didn’t have to go through this madness very many times. Right now, I’m not sure I can quite summon up grateful. Slack-jawed hair-chewing insane, maybe. But grateful gonna hafta take a back seat for now. Maybe if I hadn’t read this book during the Sickmageddon, I would feel more enthusiastic about it. 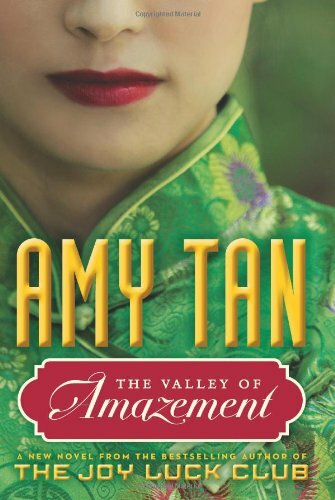 It’s quality, of course, as Amy Tan’s stuff is. Her portrayal of turn-of-the-century Shanghai transported me as a reader, not just through physical description but through highly effective analysis of the culture and mindset of its inhabitants. Her characters are vivid, in all their complex and occasionally unlikeable glory. She deftly shows how dysfunction perpetuates itself from one generation to the next, and how flawed people often pass those flaws on to their children. The plot is almost cyclical in its repetition of themes, from mother to daughter to granddaughter. And the premise is seductive and alluring: fourteen-year-old Violet, a half-Chinese, half-white girl living in Shanghai, is forced into life as a courtesan when her mother is duped by a lover with shady business dealings and questionable morals. Tan doesn’t shy away from exploring the concepts of separation and abandonment, thoroughly poking, prodding, and exposing even the ugliest and most heart-rending consequences. And of course, the salacious details of a courtesan’s lifestyle are graphic and unsettling (and therefore fascinating, of course). However, this book does require a fair bit of patience. It’s not a beach read; it doesn’t belong in your vacation stack. There’s a lot going on thematically, and the characters’ complexity requires processing. Plus, it’s six hundred pages long, which brings me back to my earlier refrain to a grinning Christ. Bottom line: Read this book, and may you do so in peace and good health.